The S.C. Department of Natural Resources (DNR), in partnership with the U.S. 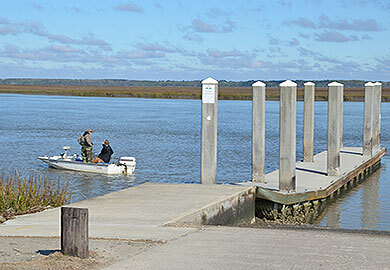 Fish & Wildlife Service, administers the National Boating Infrastructure Grant Program (BIG) in South Carolina. The BIG program provides grant funding to construct, renovate, and maintain tie-up facilities with features for transient boaters in vessels 26 feet or more in length. Examples of eligible infrastructure that may be funded include floating docks, fixed piers, breakwaters, fueling stations, and dockside utilities. In an effort to educate and inform potential grant recipients on the goals of the program, grantee eligibility, program deadlines, and allowable projects, the DNR will be hosting a Boating Infrastructure Grant Workshop on April 22, from 1 p.m. to 4 p.m. The workshop will be held at the DNR’s Marine Center located at 217 Ft. Johnson Road in Charleston, South Carolina (Directions). Although the workshop is free, we ask that those interested in attending please register to help us anticipate the level of attendance. Participants are asked to review the published rules and requirements of the program prior to the workshop. Meister at 843-953-9062 or MeisterS@dnr.sc.gov.